September 2016 Issue Featuring The Nu School Media!!! Their passion for music, lifestyle and entertainment is evident when reading articles they've written, music created, or events they've hosted. Celebrity Dame, Bianca and Chinaka, DLaw, Nayomi Charnelle & Leslie Monet are the Nu School Media that everyone knows and loves! Also, Shakeema Bouyer and her radio show Let's Talk PR interviews Anje Collins, PR extraordinaire! Sherika Staton shares her Hustle and Grind, Felice Hightower says Love the skin you're in, Kisha Green gets the inside scoop on Mr. Urban Tymes himself Carey W. Digsby, and Silvio Suarez talks one on one with #cwspeaks. 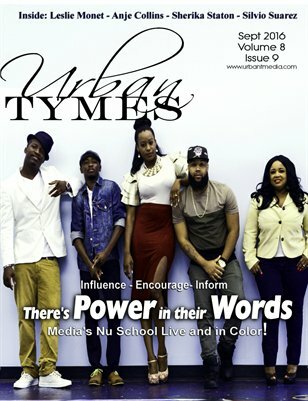 Urban Tymes : September 2016 Issue Featuring The Nu School Media!! !